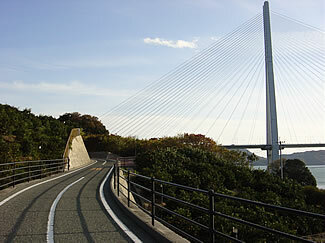 The Seto Inland Sea area really lends itself to cycling. The islands, most of which have coastal roads with very little traffic, allow us to enjoy a relaxing ride while taking in the beautiful views. A ride around the smaller islands takes less than one hour. Most of the islands are accessible by ferry, allowing you to take your own bicycle, while the easy availability of rental bicycles allows anyone to enjoy this pastime. The coastal roads offer stunning scenery both of the sea, and also the beautiful mountains, with each island offering its own special attractions, which change with the passing of the seasons. Especially in 生口島 and 大崎下島, the mountains are blanketed in orange and at the end of fall, you can see a spectacular view of ripe-yellow oranges all over. Spring time is harvest time and the wonderful smell of citrus fills the whole islands. 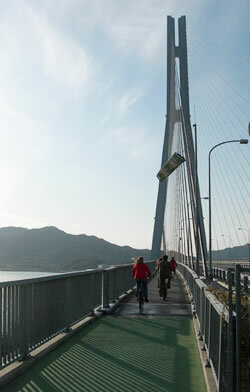 The best cycling spot in the Seto Inland Sea is of course Shimanami Kaido. Why not challenge yourself to cover the entire 80km sea road by bicycle? The 14 convenient rental and drop-off points along the route let you skip the exercise, relax, and take in the wonderful view of the sea from the bridge. The entire route may be a little strenuous for some, but you can always take in a few of the islands, each of which offer their own unique beauty and character. On a practical note, the rental bicycles available are generally basic - 3 geared models, and suited to the shorter Japanese rider, so if you are over 165cm tall it may be a good idea to buy an extra long saddle pole! Bicycles can't be transported on trains unless they have their front wheel removed and are packed snuggly in a special bicycle bag..